Providing education, advocacy and assistance to the community, providing help to victims of child abuse and domestic violence. 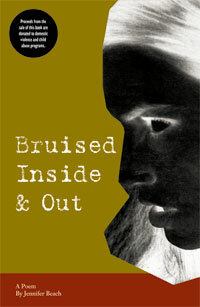 The words of Jennifer’s poem have been published in booklet form. The professional design and layout and 5″ by 8″ size partner with the power of the message of the poem to provide an excellent tool for helping us to feel the pain that child abuse creates. Our hope is that through sales of the booklet, donations and grants received that the Jennifer Beach Foundation can give copies of the booklet to schools, youth groups, domestic violence and child abuse shelters, and other charitable organizations. The poem is also available in poster format. The poster is 12″ x 18″. In addition to distributing the poem as described above it is our intention to make monetary donations to other 501(c)(3) organizations that work first hand with abused victims from the proceeds of the sale of the booklet and poster. Read more about the 1st annual Save the date benefit for battered women golf tournament. Read the poem (click here) that led to the creation of Jennifer Beach Foundation. 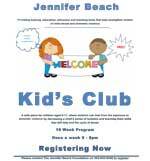 Need Child Abuse or DV Help? If you or someone you know is in an abusive relationship and needs help or would like to speak with someone about domestic violence, please contact us 253-833-5366. 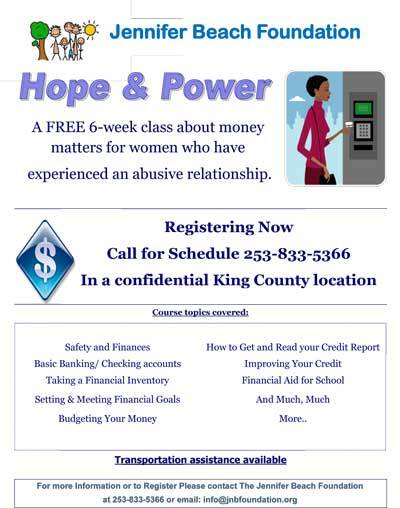 A FREE 6-week class about money matters for women who have experienced an abusive relationship.